Expressing India's concern over killing of its citizen in the Nepal Police firing, Ministry of External Affairs Official Spokesperson Vikas Swarup on Monday said India is deeply concerned at reports of firing in Birgunj, as issues facing Nepal are political in nature and cannot be resolved by force. 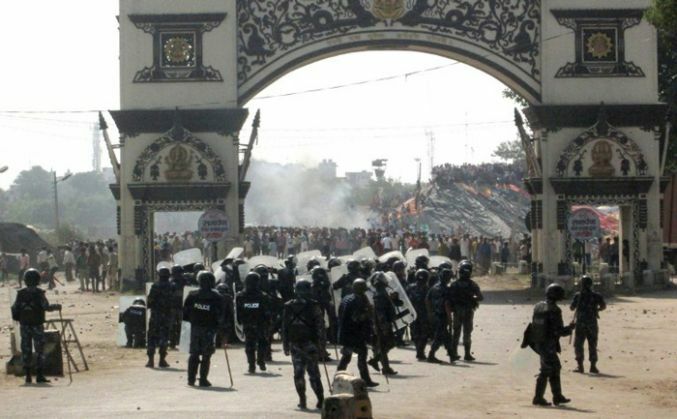 One person has been killed and six others injured in firing by the Nepal Police during protests at the Indo-Nepal Border near Bihar's Raxaul town. Earlier today, a second year BA student was killed when the Nepal Police opened fire. Among those injured, three were baton-charged, while the rest suffered bullet injuries. Swarup said, "Causes underlying the present state of confrontation need to be addressed by the Government of Nepal credibly and effectively." "Indian freight forwarders and transporters have voiced their worries again today (Monday) about the deteriorating situation across the border. We are advising them to exercise caution and not put themselves in danger. We are monitoring the situation carefully," he added. According to reports, the borders have been sealed again. All trucks, including fuel carriers, have been barred from entering Nepal. Madhesi protesters, who have reportedly blocked the Maitri bridge, claimed that they were 'baton-charged' by the Nepal Police on Monday for blocking a bridge at the Indo-Nepal Border near Bihar's Raxaul town. The protesting parties have demanded, among other things, withdrawal of armed police force from Terai districts and withdrawal of cases against their leader and cadres and martyrdom status of those killed during protests. According the Human Rights Watch, at least 45 people were killed during the protests in August and September. For over two months now, the Madhesi protesters have been opposing Nepal's new Constitution.